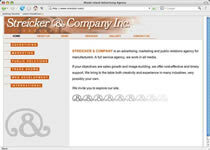 www.streicker.com We did a good job, though the client is absolutely impossible. Search for a “RI ad agency” and see where we come up. We’re usually the top hit. You have gotten this deep into our story without looking up Ogilvy & Mather, so our site seems to work. Don’t settle for Ogilvy. www.evanscap.com We coined the term, "evanscap," which is now not only the URL but is a generic term in the industry. The site is not beautiful but is functional and incredibly successful. Every month, evanscap.com draws thousands of interested visitors who average almost seven pages per visit. The site was designed so that the client could have direct input, mostly making technical changes on his own. www.evanstechnology.com We built the site, not only writing all the general and the very technical copy, but doing the microphotography and organizing the URL. We continue to maintain the site, which brings in more RFQs than the entire salesforce. www.americansafetyvest.com A shopping cart that works! We designed the site — copy, layout and even photography of the client's reflective and fluorescent products. We organized and built the site, too. We now maintain and promote it as one in a set of three sites. www.americansafetyflag.com This is a companion site to www.americansafetyvest.com. At this site the company does business under a different name and presents itself as a specialist in fluorescent flags. It sells wholesale throughout North America. 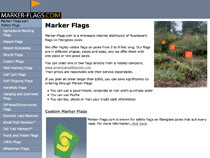 www.marker-flags.com The third in this set of three sites, this site is aimed at a small but worthwhile market — customers who want expensive, highly customized fluorescent flags.